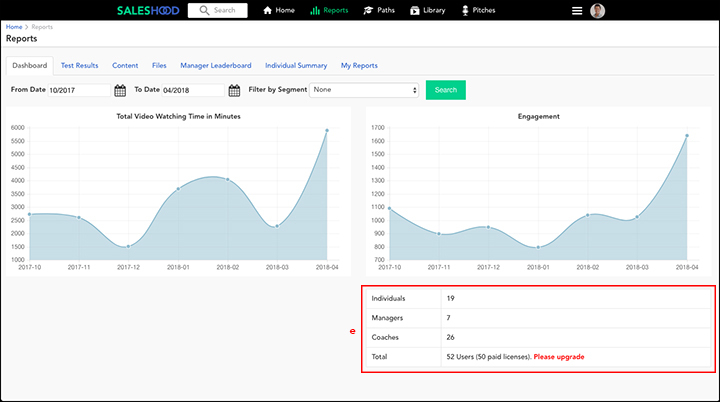 Publisher or Coach role can use the Reports page to view the engagement statistics throughout the organization. To access this page, click on Reports on the tabs bar. 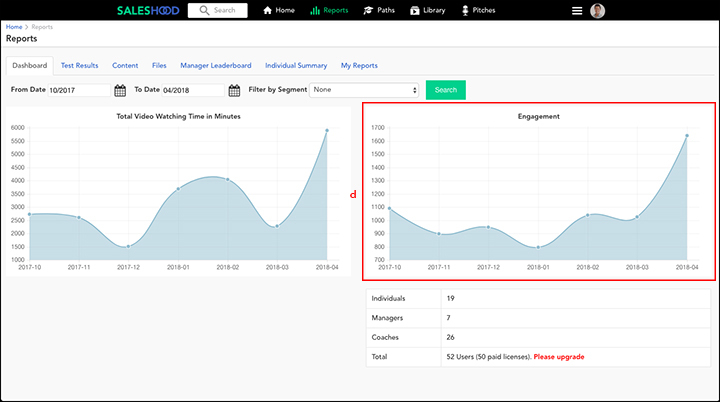 Within the Dashboard tab, you will see a graphical representation of engagement within SalesHood based on usage data of participants. These graphs depict Total Video Watching Time in Minutes and Engagement. 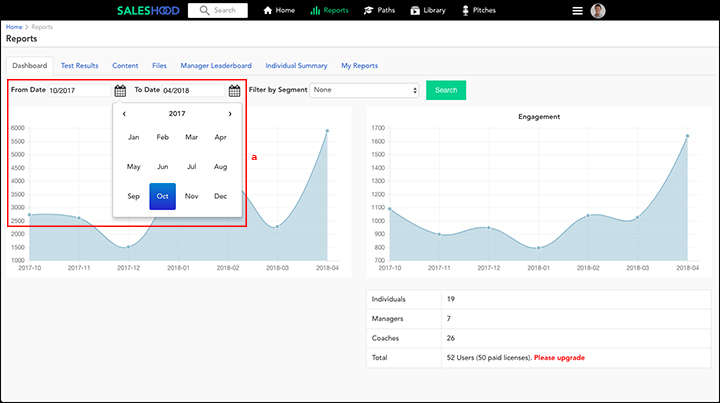 Additionally, the Dashboard is where you will be able to see the number of users in your system, both for user management as well as licensing agreement purposes. 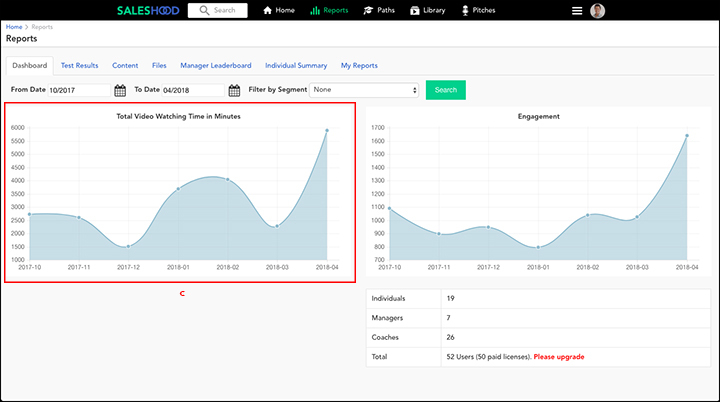 a. Clicking on the calendar icons will calibrate the graphs and licensing stats based on the date range. Note: Click Search to reset graph to the designated date range. You will be able to see the graphs denoting the aggregate stats for the individuals from within a segment. c. The “Total Video Watching Time in Minutes” graph shows user engagement in your instance based on video watching time. This is an effective metric that correlates video watching time with participants’ success metrics. d. The Engagement graph shows the aggregate data of all users’ activities in the system. In the SalesHood system, “activities” are defined as: comments (for Pitch, exercise submissions, videos in a video module, etc. ), reviews (scoring and review of Pitch videos), submissions (exercise submissions, videos for a Pitch, etc. ), and content created (creating and publishing a Huddle and/or Pitch program). 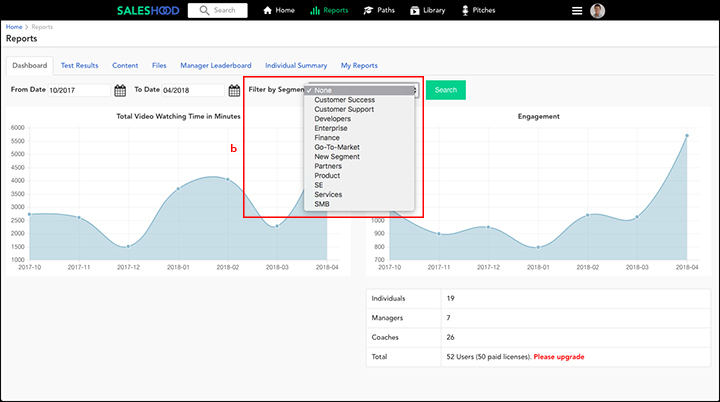 e. This section of the Dashboard will show the current number of users in your instance, organized by the following roles: Individuals, Managers, Publisher, and Coaches.